Currently in its 11th edition, “Robert’s Rules of Order” is a 669-page volume that delineates a set of rules for properly implementing parliamentary procedure. Commonly referred to as RONR- Rules of Order Newly Revised- Robert’s Rules (or any derivation thereof) is designed to assure that all members of a council, board, commission or group (formally referred to as a deliberative assembly) have an equal opportunity to participate and express their opinions. While the concept behind Robert’s rules is simple, implementing those rules can be very complex, especially when debate becomes confrontational. That complexity prompted Buddy Scott of Snellville’s Downtown Development Authority to organize a parliamentary procedure workshop, which took place at Snellville City Hall on March 29, 2014. Everyone who attended was rewarded with an outstanding presentation by Dennis Conway, a Professional Registered Parliamentarian. Mr. Conway explained many of the finer points of Robert’s Rules of Order and their proper application. However, if you’re not involved with a group that holds meetings to deliberate issues and make decisions, the concept and application of parliamentary procedure rules may be a bit of a mystery. The term “parliamentary procedure” derives from the rules that were used by the English Parliament, which were implemented by American colonists as early as the 1600s. 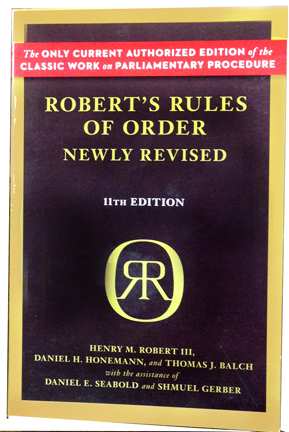 However, no specific set of broadly accepted procedural rules existed until 1876, when Henry Robert released the first edition of “Robert’s Rules of Order”. Although it isn’t the only set of rules governing deliberative assemblies, RONR has become almost universally adopted within the bylaws of assemblies ranging from a handful to a roomful of members. RONR is specifically designed to handle the challenge of getting a group of people with potentially different opinions and viewpoints to debate the relative merits and drawbacks of their positions regarding specific issues, arrive at a proposed solution and vote to implement it. In some instances, the solution desired by the majority of members may be to tak no action at all. In that case a proposed agenda item may not ever come to a vote. As an example, if a member of a city council decided that the walls inside City Hall needed to be painted, he or she could place an item on a meeting agenda for consideration and action on issuing a request for quotations and awarding a painting contract to the lowest bidder. Such an agenda item would normally include specifics as to cost, paint color and time frame for completion of contracted work. Before the staff could issue a request for a quotation, (RFQ) the council would have to debate the details to be included in the RFQ and then vote to proceed. To that end, a council member would make a motion containing all of the vital information needed in the RFQ. Another council member would have to “Second” the motion before it could be debated. By either making or seconding a motion, neither council member is stating that he or she is in favor of issuing the RFQ, only that they have an interest in discussing it. If none of the Council members thought the walls needed to be painted, or simply objected to the language in the RFQ, none of them would make a motion. If only one member was in favor of issuing an RFQ, there would be no second. Without both a motion and a second, there can be no discussion and consequently no vote. The agenda item would then be said to have died “for lack of a motion”, or “for lack of a second”. If a motion is made and seconded, it’s open for debate. This is where things can get really dicey if there are significant differences of opinion. Within a deliberative assembly operating under Robert’s Rules of Order, all members are equal. The rules are therefore designed to enable the meeting chairman to provide every member with an opportunity to present his or her opinion, and where appropriate, to allow public comment. To prevent a free-for-all, and people talking over each other, all comments are required to be made to the chairman. After a motion is made and seconded, and debate is concluded, the chairman typically calls for a vote. However, rather than being in favor or against a motion as presented, one or more members of an assembly may want to make modifications before a vote is taken. In the painting contract example, one member might want to change the maximum cost, or the color. That member would then make a motion to amend the original motion; if the amended version were seconded, the council would then vote on it. There are a number of other motions that an assembly member can make, each one designed to assure orderly and fair discussion. To that end, it is the responsibility of the meeting chairman to ensure that each member not only has the ability to speak at the appropriate time, but follows the appropriate rules when participating in discussions or making motions. Robert’s Rules is designed to cover virtually any type and size of assembly. As such, many of the rules may rarely apply to a small body such as a city council or county commission. Consequently, many codes of ordinances include rules of procedure (primarily a sub-set of Robert’s Rules) along with a reference that a specific edition of RONR applies to any situation not covered by the rules of procedure in the code of ordinances. On occasion, the wording of a city’s or county’s rules of procedure may differ slightly from that in Robert’s Rules. This is typically done to simplify the running of meetings that include a limited number of voting members or deal with relatively simple agenda items. However, regardless of the size of an assembly or the nature of the matters it deliberates, agenda items, all rules of procedures are designed to facilitate meetings that are conducted fairly, with all members being afforded an equal opportunity to participate.